Ducatio: Engineering at its finest. 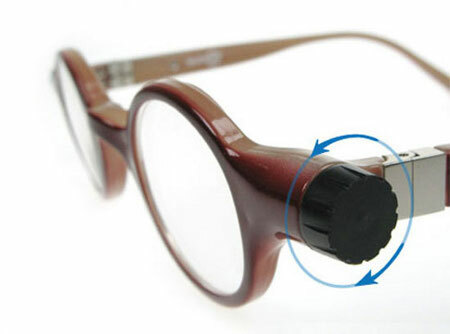 These are adaptive-lens eyeglasses by Adlens. They are able to correct almost anybody's vision, all with the simple twist of a knob. 'How they work: The lenses are hollow, with a plastic sheet stretched across it on the inside. When you twist the dial, fluid pumps in between the sheet and the lens. The fluid is clear and has a high refractive index. The more fluid that pumps in, the more the curvature of the sheet increases, making the lens more powerful.' Adlens markets these glasses for the developing world!!! edit: There are also similar concepts from the Netherlands and Germany. They are made from plastic.